There’s quite a story behind the picture on our poster promoting the talk at Oundle Library on Saturday, 13 October: ‘Barnes Wallis & The Bouncing Bombs’. The picture (Hopgood’s Courageous Run) is by renowned British artist Simon Atack. 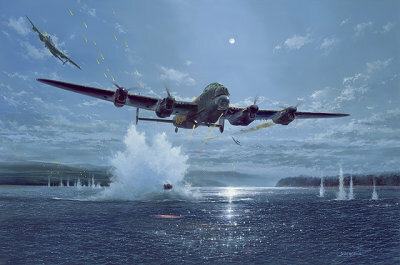 In its own right it’s a powerful evocation of the Dambusters’ raids, but Simon has been kind enough to share the story that inspired him to paint it. He says: ‘I was asked to make a painting of the Dambusters’ raids for the 70th anniversary commemorations in 2013. The operation has already been covered by a great number of artists, so I wanted a story to tell – something about the raid or a crew that hadn’t had the spotlight on it before. And that’s when I discovered a little of this young, 21-year old pilot, Flt. Lt. John Vere ‘Hoppy’ Hopgood DFC and Bar, his crew of Lancaster M-Mother, and their action in the Möhne Dam attack. ‘Briefly, anti-aircraft fire had shredded one engine and M-Mother was already burning like a torch when it started its attack run on the target. Hopgood himself had been badly wounded and the rear gunner, George Gregory, killed. Nonetheless Hopgood continued his approach and the bomb aimer released his mine just as cannon shells tore through the aircraft. Not surprisingly the bomb fell a fraction too late and as it hit the water for the first ‘bounce’ a streak of tracer fire from the left tower battery raked the length of the Lancaster’s wings, igniting the two portside fuel tanks and setting her ablaze. This was the story Simon decided to tell in his powerful painting. In our next blog Simon talks about the research he did to make sure the details in the picture were as accurate as they could be….